2012 opens with a higher than usual number of 'balls in the air' and dramas at play across the world stage. Although the recovery seems to be taking hold, there are some scary scenarios for how world events might unfold that seem credible. Here we discuss the impact of this uncertainty on businesses and their planning and execution for 2012. 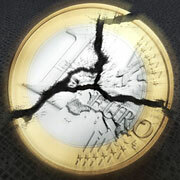 The Euro—When the European currency was created, those that predicted it could not endure without deeper political integration between members (i.e. ‘loss of sovereignty’) seem to be proven right. Will the EU nations have the stomach to take this bitter medicine or will the Euro fall apart? It could mean the difference between continuation of the global recovery vs. sovereign debt defaults, bank runs, a freezing of global credit markets, and a global depression. Youch! Authoritarian Regimes—Following the fall of regimes in Tunisia, Libya, and to an extent Egypt,1 it is a time of turmoil and change in authoritarian regimes around the world. Some of it promising (Myanmar/Burma, perhaps Cuba), some of it deeply troubling (Syria, Iran), some enigmatic (North Korea). What happens in these countries matters. It can mean the difference between peace vs. war, stability vs. disruption to regions, markets, and critical trade routes. Natural Disasters—2011 was a ‘banner year’ for natural disasters. 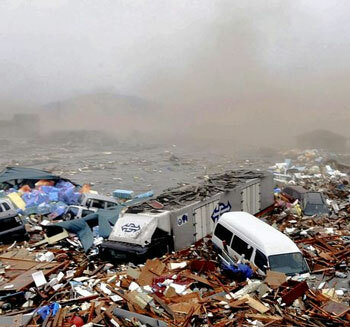 Within the first six months of 2011, property damage from natural disasters had already surpassed any full year prior. Research by the IPCC (International Panel on Climate Change)2 concludes “It is very likely that hot extremes, heat waves, and heavy precipitation events will continue to become more frequent . . . typhoons and hurricanes will become more intense, with larger peak wind speeds and more heavy precipitation . . .” Get ready for it. U.S. war zones—Will Iraq devolve into three states, or worse yet civil war? Will Afghanistan’s civil war re-emerge as the US draws down troops? Is Pakistan in danger of becoming the first failed state with nuclear weapons? Stay tuned. The Economy—As of now, the signs of recovery in the U.S. are more encouraging than they have been for years. Employment numbers are improving. Consumer spending is up. Major hedge funds have recently even been betting on a rebound in the housing sector. But growth has slowed in China, and Europe is completely stalled and could easily slip back into recession at a point in time when it needs growth the most. Skeptics of a global recovery abound, as there are still plenty of things that can go wrong—for example, if the Euro disintegrates, a deep worldwide recession or even depression is likely. The difference in possible trajectories is stark—anything from a robust, accelerating recovery all the way to a crushing global depression are plausible scenarios for 2012. These global uncertainties translate into formidable challenges for individual firms. A company’s growth plans drive many decisions, such as hiring and capital investments, as well as acquiring long lead time components, materials, and services that must be planned and committed to many months in advance. For example, demand in the semiconductor industry is highly cyclical and highly dependent on getting the next generation of technology out ahead of the competition. But a new fabrication plant can cost two billion to five billion dollars or more and take 18-24 months to build. When a semiconductor manufacturer guesses wrong about how much capacity to build and when to build it, they can end up with billions of dollars of idle capacity (and starved for cash), or conversely with billions of dollars of lost market share due to inadequate capacity. Some people attribute Intel’s success to their track record of investing in new plants at the right time. In uncertain times, a firm’s critical suppliers may also be reluctant to invest in capacity and technology improvements, or worse yet they may be in danger of insolvency. 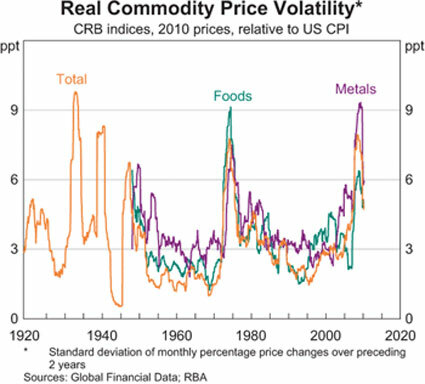 Further, we expect continued increases in commodity prices (see Figure 1) and commodity price volatility (near historic highs—see Figure 2), making planning even more difficult. 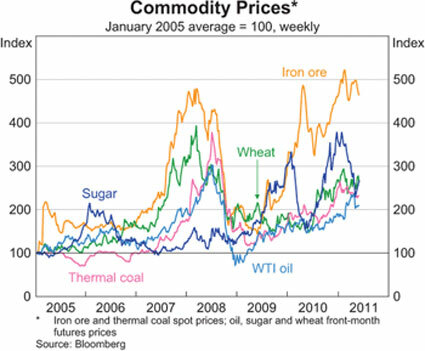 Commodity price fluctuations have impacts across the enterprise. 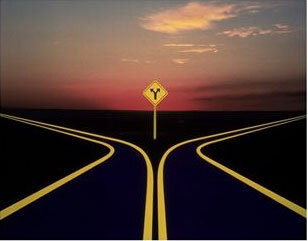 When fuel prices rise beyond a certain point, it changes the optimum sourcing and distribution strategy for the firm. Above a certain cost of fuel, it may become more economical to source locally or regionally vs. overseas. It also changes the ratio of inventory carrying costs to transportation costs, impacting the optimum distribution network design. The cost or availability of raw materials or components can impact product designs, as we saw when some electronics firms designed around the tantalum shortages in the late 90s. And of course volatile commodity prices impact a firm’s hedging strategies, which can eat into profits. Even at the height of unemployment, there has been a talent shortage brewing in many key sectors and specialties. Our 2011 Business Priorities Survey found that hiring and retaining talent was the second highest concern of executives (after budget challenges). When the economy rebounds, this could change from concern to crisis. Given all of these challenges, what can companies do? In Part Two of this article, we will look at time-proven strategies and practices for creating adaptable enterprises.